I think I'm having birthday party withdrawals. My celebration last Sunday was such a blast that I've been craving sweet festive treats all week long. I've also missed baking and (this chocolate eclair cake was my last food post!). I've been so busy with Glitter Guide and trying to save every penny that my baking passion has been put on hold. But, I hope to carve out time once a week to get back in the groove. While technically this recipe isn't really "baking", it was a good start. I'm such a sucker for anything with colorful sprinkles. I made these more for the look of them rather than the taste, but I ended up with a pretty and scrumptious dessert....too scrumptious actually. I had to pack them up for my boyfriend to take to work so I would stop snacking on them! Melt butter in a large saucepan over low heat and add marshmallows. Stir until they begin to melt, adding in cake mix one spoonful at a time so its combined. Stir in cereal so it is completely coated with marshmallow mixture. Sprinkle in half of the sprinkles and mix. 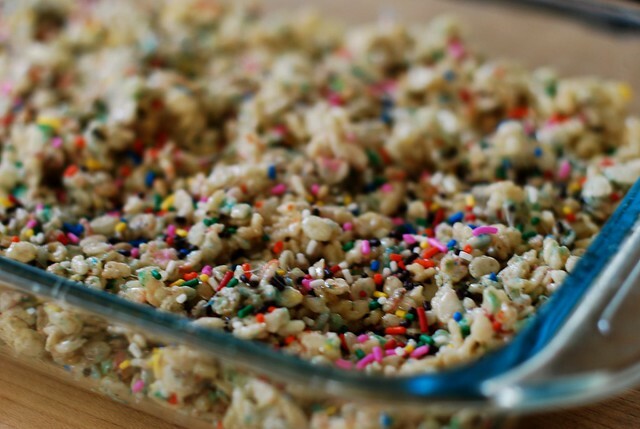 Press into a baking dish (any size will do) and top with remaining sprinkles. Let sit for about 30 minutes before cutting. I find spraying a knife with nonstick spray helps to cut them. These are so fun and colorful! Plus they combine possibly the two greatest desserts ever -- I'm obsessed. they look so yammy and cute! These are so pretty they look more like a decoration than a food! Love all the colourful sprinkles in them. Hope you're having a lovely week. You had me at cakebatter.. They look so good. Must try recepie immediately!! hi! i just came across your blog and i loved it! love your style! check out my blog and follow if you like, i will do the same! So sorry I missed your birthday Taylor! Happy Belated! These crisy treats instantly made me think of your litter Guide banner! Perfect branding and marketing! Nom nom... wish I had one now! What a cute idea! I can't wait to try it! Omg these look phenomenal! 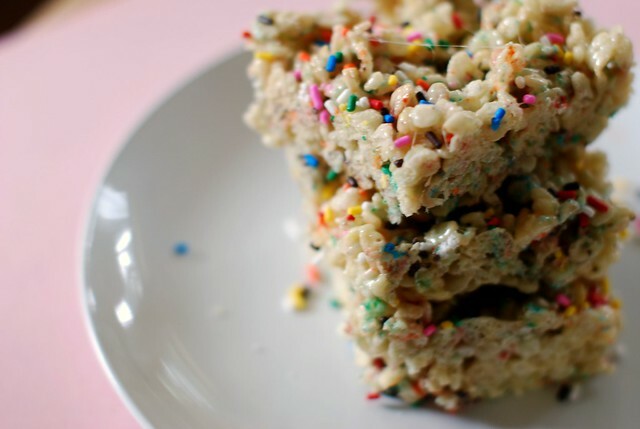 They're combining my two favorite ideas, rice krispy treats and funfetti! Those look delectable. I'm a sucker for colorful sprinkles too. Yummy!! Never tried that before, but something similar is coco krispies and chocolate cake mix - yum! Thanks for posting - maybe I'll make some tonight! Woah, these sound to die for! I must try them. So later today I was going to make a rice crispy recipe that involved granola. However, this just made me not want to go healthy lol. Thanks! 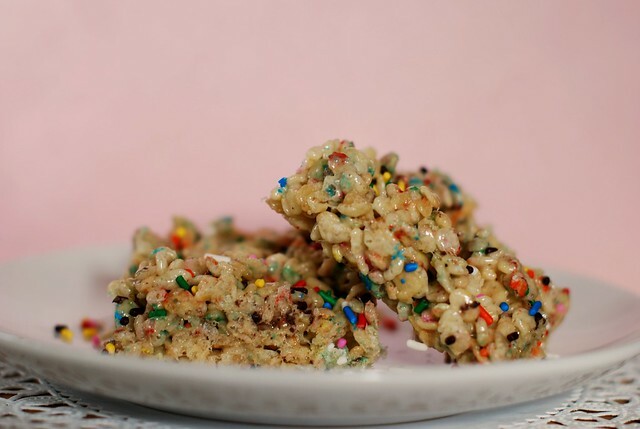 Cake batter and sprinkles...these are like Rice Krispies on steroids! They look soo good... can't wait to try! I LOVE anything with sprinkles too. My birthday is coming up and I will definitely be making these! Thanks for the idea! these are so pretty! I am definitely going to attempt to make them (and I say "attempt" because I'm soo bad in the kitchen!) But these look super good. thanks so much for sharing this recipe! Look how pretty they turned out! Love the colors! Sprinkles are by far my fav... on anything! Hey ladies-- thanks! It's sooo easy. You will love them! Now that's a dessert right up my alley. Yum! how festive! i love the colorful sprinkles! Ok, these look too pretty to even eat, Taylor! I just love them. 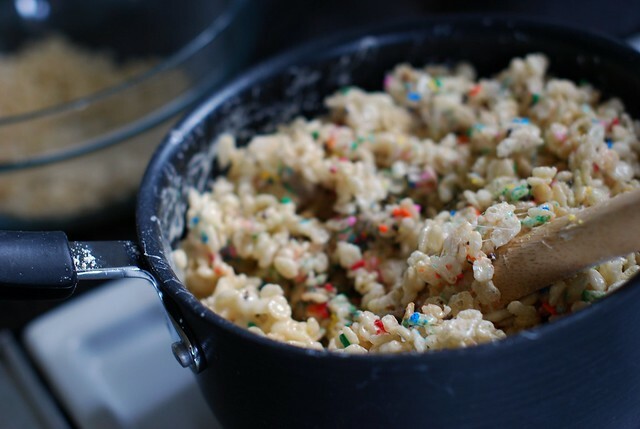 Rice Krispies are my absolute favorite. I just love everything about them, and am definitely going to make your creative version. I love how these look so good BUT also so pretty! These are so cute! I love adding sprinkles to everything. They make everything so much brighter and cuter. Oh, those look just TOO good. 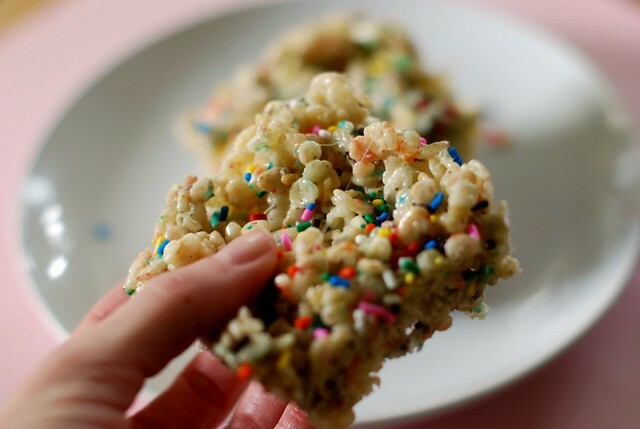 I'm not a dessert person but I love rice krispy treats! These scream spring time... yum! Sprinkles make me happy too. If only every meal tasted better with them I'd eat joy for breakfast, lunch and dinner. ohhhh my gosh those look absolutely delicious!!! Sprinkles? I'm down. WANT. SOME. P.s. ... yes I just realized how stupid the above comment sounds. Please read it in a silly voice, or something, to make it more palatable. Please. yum! anything with sprinkles is good in my book. Yumz! What a great way to spruce up a classic treat! I lovvvve rainbow sprinkles.